Fraserburgh were unable to hold on to their lead after scoring an early goal against Formartine United in a 1-1 draw. In what was the only Highland League game to survive the weather over the weekend, played on a heavy pitch, two first half goals saw the teams take a point each out of the match. The fixture on Saturday, January 16 was played at Bellslea Park. The home side took the lead in the 15th minute with a brilliant overhead kick from 35-year-old Russell McBride. Formartine failed to clear a corner kick, which McBride took full advantage when he hooked the ball over his shoulder past United goalkeeper Andy Reid from the six-yard line to score. However, Formartine were able to equalise in the 33rd minute when Garry Wood scored. Broch central defender Bryan Hay won man of the match. He thinks that a draw was a fair result: “We have taken four points in our last two games against Cove and now Formartine, so we have got to be pleased after the heavy defeats we suffered against Keith and Brora in the last two games. “It was a great performance. Of course we wanted to win but a draw is still a good result against Formartine. 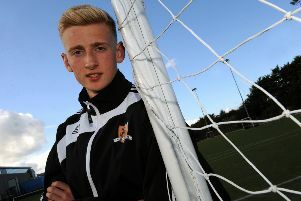 “Our young goalkeeper Ed Finn came on for the second half and did really well. He made two or three really good saves, especially the one just two minutes after coming on,” he said. Broch manager Mark Cowie said: “It is a point gained rather than two dropped and a draw was fair. “We played the better football on a muddy pitch, especially in the first half when we were excellent, and Formartine were lucky to go in at the break with the score 1-1. Broch’s next game is an away game against Fort William on Saturday, January 23.